Once there was an ocean liner; its builders said it was unsinkable. Nature had other ideas. On Monday evening, as Hurricane Sandy was becoming Post-Tropical Cyclone Sandy, pushing record amounts of water on to Atlantic shores from the Carolinas to Connecticut, the Nuclear Regulatory Commission issued a statement. Oyster Creek, the nation’s oldest operating nuclear reactor, was under an Alert. . . and under a good deal of water. As reported earlier, Oyster Creek’s coolant intake structure was surrounded by floodwaters that arrived with Sandy. Oyster Creek’s 47-year-old design requires massive amounts of external water that must be actively pumped through the plant to keep it cool. Even when the reactor is offline, as was the case on Monday, water must circulate through the spent fuel pools to keep them from overheating, risking fire and airborne radioactive contamination. If hoses desperately pouring water on endangered spent fuel pools remind you of Fukushima, it should. Oyster Creek is the same model of GE boiling water reactor that failed so catastrophically in Japan. [Oyster Creek is] in a refueling outage. That means that all the nuclear fuel is not in the nuclear reactor, but it’s over in the spent fuel pool. And in that condition, there’s no backup power for the spent fuel pools. So, if Oyster Creek were to lose its offsite power—and, frankly, that’s really likely—there would be no way cool that nuclear fuel that’s in the fuel pool until they get the power reestablished. Nuclear fuel pools don’t have to be cooled by diesels per the old Nuclear Regulatory Commission regulations. A site blackout (SBO) or a loss of coolant issue at Oyster Creek puts all of the nuclear fuel and high-level radioactive waste at risk. The plant being offline does not change that, though it does, in this case, increase the risk of an SBO. If only regulators had held on to that release just one more minute. . . .
SCRIBA, NY – On October 29 at 9 p.m., Nine Mile Point Unit 1 experienced an automatic reactor shutdown. The shutdown was caused by an electrical grid disturbance that caused the unit’s output breakers to open. When the unit’s electrical output breakers open, there is nowhere to “push” or transmit the power and the unit is appropriately designed to shut down under these conditions. “Our preliminary investigation identified a lighting pole in the Scriba switchyard that had fallen onto an electrical component. This is believed to have caused the grid disturbance. We continue to evaluate conditions in the switchyard,” said Jill Lyon, company spokesperson. Nine Mile Point Nuclear Station consists of two GE boiling water reactors, one of which would be the oldest operating in the US were it not for Oyster Creek. They are located just outside Oswego, NY, on the shores of Lake Ontario. 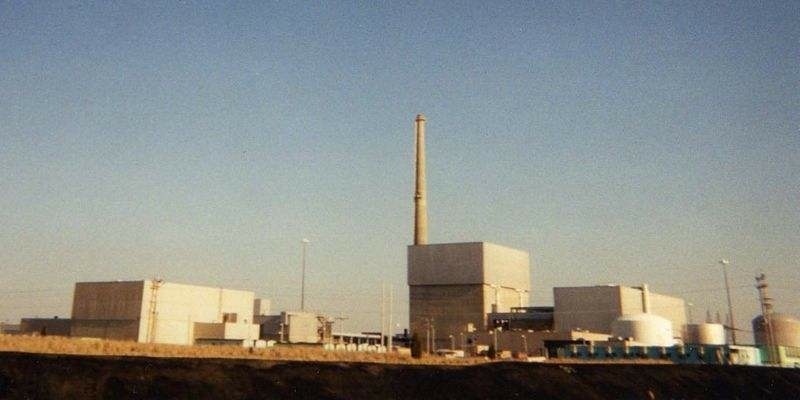 Just one week ago, Unit 1–the older reactor–declared an “unusual event” as the result of a fire in an electrical panel. Then, on Monday, the reactor scrammed because of a grid disturbance, likely caused by a lighting pole knocked over by Sandy’s high winds. An hour and forty-five minutes later, and 250 miles southeast, another of the nation’s ancient reactors also scrammed because of an interruption in offsite power. Indian Point, the very old and very contentious nuclear facility less than an hour’s drive north of New York City, shut down because of “external grid issues.” And Superstorm Sandy has given Metropolitan New York’s grid a lot of issues. While neither of these shutdowns is considered catastrophic, they are not as trivial as the plant operators and federal regulators would have you believe. First, emergency shutdowns–scrams–are not stress-free events, even for the most robust of reactors. As discussed here before, it is akin to slamming the breaks on a speeding locomotive. These scrams cause wear and tear aging reactors can ill afford. If these plants were offline, or running at reduced power, the scrams would not have been as hard on the reactors or the environment. Hitting the breaks at 25 mph is easier on a car than slamming them while going 65. But the NRC does not have a policy of ordering shutdowns or reductions in capacity in advance of a massive storm. In fact, the NRC has no blanket protocol for these situations, period. By Monday morning, regulators agreed to dispatch extra inspectors to nuclear plants in harm’s way (and they gave them sat phones, too! ), but they left it to private nuclear utility operators to decide what would be done in advance to prepare for the predicted natural disaster. Operators and the Nuclear Regulatory Commission spokes-folks like to remind all who will listen (or, at least, all who will transcribe) that nuclear reactors are the proverbial house of bricks–a hurricane might huff and puff, but the reinforced concrete that makes up a typical containment building will not blow in. But that’s not the issue, and the NRC, at least, should know it. Loss of power (SBOs) and loss of coolant accidents (LOCAs) are what nuclear watchdogs were warning about in advance of Sandy, and they are exactly the problems that presented themselves in New York and New Jersey when the storm hit. The engineers of the Titanic claimed that they had built the unsinkable ship, but human error, corners cut on construction, and a big chunk of ice cast such hubris asunder. Nuclear engineers, regulators and operators love to talk of four-inch thick walls and “defense-in-depth” backup systems, but the planet is literally littered with the fallout of their folly. Nuclear power systems are too complex and too dangerous for the best of times and the best laid plans. How are they supposed to survive the worst of times and no plans at all? This entry was posted in Energy and tagged boiling water reactor, defense in depth, flooding, Fukushima, GE, Hurricane Sandy, Indian Point, LOCA, loss of coolant accident, New Jersey, New York, Nine Mile Point, NRC, nuclear, Nuclear Power, Nuclear Regulatory Commission, Oyster Creek, radioactive waste, SBO, scram, site blackout, spent fuel pool, Superstorm Sandy by Gregg Levine. Bookmark the permalink. Oyster Creek; 36 of 43 emergency warning sirens in the emergency planning zone have failed in the last 24 hours. Nine Mile Point; SCRAM due to load reject. The reactor was running at 100% when the fault caused the reactor into emergency automatic shutdown. Peach Bottom; Lost 31 of 97 warning sirens for the emergency planning zone due to Sandy. Nine Mile Point; Lost one grid power line causing emergency diesels to kick in. Salem Unit 1; Scram from 100% power after cooling water intakes were blocked by storm debris and high water from the storm. This is just another “wake-Up” call that Nature can destroy any land based nuclear reactor, any place anytime 24/7/365! The USA has just be lucky, so far and should be decommissioning these RISKY reactors ASAP and replacing them with Solar (of all flavors) because we cannot afford a Trillion Dollar Eco-Disaster like Japan now has; they said their Reactors were SAFE before 3/11/11 and now we all know better! Loss of external power to a nuclear plant is not trivial, if Greg Palast in his book Vulture’s Picnic is to be believed. According to Palast, backup diesel generators routinely failed (drive shafts broken) during safety tests in the 1980’s. Rather than fix the problems, the Reagan admin ordered the NRC to cover up the problems. Luckily, last night only one nuclear plant had to use its diesel generators which worked fortunately. They knew Hurricane Sandy was coming for days so much so that they even nick-named it Frankenstorm. In all that time, no consideration was given to taking those plants offline before the storm arrived? What kind of contingency/emergency planning do they do at these plants? Airports are capable of moving entire fleets of aircraft to safety in advance of a storm, but Nuclear Power Plants can’t go offline temporarily with something like 5-6 days warning? Unlike Linda Gunter and Kevin Kamps, nuclear professionals are people who can do math and who understand concepts like the latent heat of vaporization. According to a recent well documented and sourced paper published in a reputable peer reviewed journal, there was never any danger of boiling in the spent fuel pool at Fukushima Daiichi Unit 4, even after a complete loss of power that lasted for several weeks. The reason is simple – once the water in the pool reaches a temperature of approximately 90 Celsius, the rate of evaporation is sufficient to keep the temperature from rising any more. Each day, the pool, which starts with a depth of about 25 feet above the top of the fuel rods, will loose about 2 feet of water. All one needs to do to prevent damage is to add water within a couple of weeks. Oyster Creek has at least three separate large tanks of pure water that can be used before they have to resort to using salt water. It is easy to spread fear, uncertainty and doubt about nuclear energy, but when are critical thinkers going to start asking when the sky is really going to fall? After all, the professional antinuclear activists have been predicting it for decades. In the fifty-year historyof nuclear energy use, there has been only one accident at a commercial nuclear facility that caused any human radiation injuries.